Espresso - my son in the background! 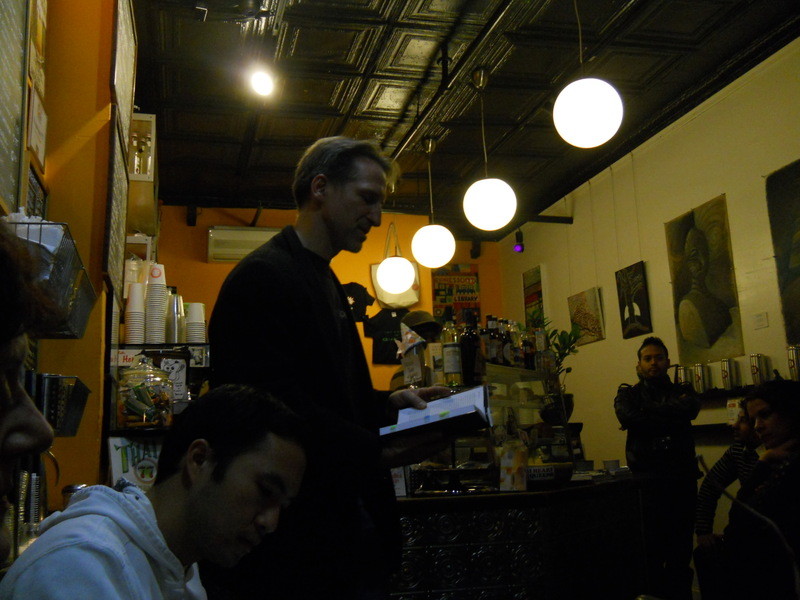 I read at Espresso 77 last night. My son sold books for me and gave out free mugs as gifts. Four friends, ten customers, and three employees listened in. I read the opening six pages of Open Wounds and the first five pages of the second part, The Bells of Hell – where Lefty is introduced to the reader and to Cid – the protagonist. The shop turned off the music. The customers looked up from their conversations and laptops, took out their earphones, put away their phones. Just about everybody tuned in for twenty minutes. It’s hard not too in such a small space. I stood by the register with my back to the milk and condiment cart. The owner’s art-work surrounded me on both walls. I wore my Espresso 77 t-shirt which says, “I love espresso,” on the front and Espresso 77 on the back. The writing is in white and red. The t-shirt is black. I wore my special, thick, writer-ly, wool coat. It doesn’t have elbow patches. It is slate black. And it is cool. I may not be cool. 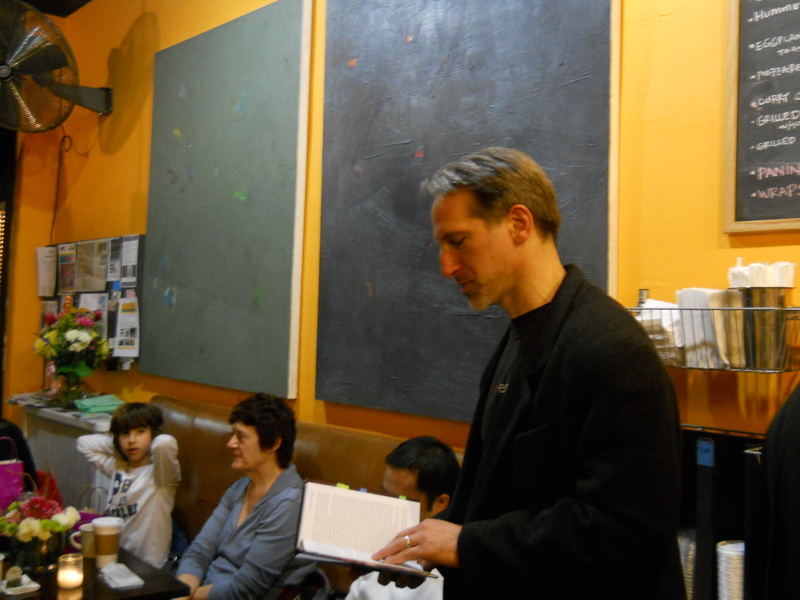 My son sold three books – two to friends, and one to a customer who got into the reading and decided to give it a try. It was just about perfect. Earlier that day my son and I went to a local pool hall and played ping-pong – 30 pool tables, 5 ping-pong tables, 2 air hockey tables, and one foosball table. I introduced my son to foosball. He liked it – a lot. If the sun had come out and it had rained diamonds it couldn’t have been a more perfect day. This entry was posted on December 6, 2011 by Joe Lunievicz. 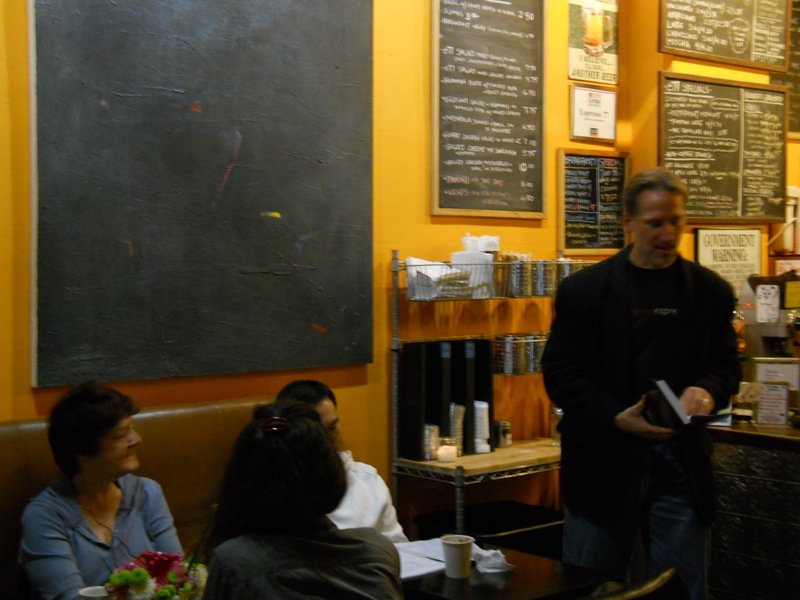 It was filed under Blog, Espresso 77, Events, Open Wounds, Public Speaking, Reading . You are cool, but your hair is getting long. From my point of view: having hair to be able to grow out a bit is cool. From your friendly neighborhood drill sergeant’s point of view: you need to keep it high and tight.